The Flash Gun: What it is, what it does, and why you want one! A simple flash gun. This one is a YN-560. A flash gun is a term that refers to what most photographers call a speedlight flash. A flash gun is made to attach to the hot shoe of a camera and automatically fires when a picture is taken. Flash guns can also be used for off-camera flash, where the flash is not touching the camera. Off-camera flash is a popular technique because it provides more interesting highlights and shadows. The term flash gun is somewhat antiquated since most photographers prefer to simply call it a speedlight, but you may hear this term from older photographers as well as those who talk about photography so much that they feel they need a new term once in a while (of which I'm guilty). 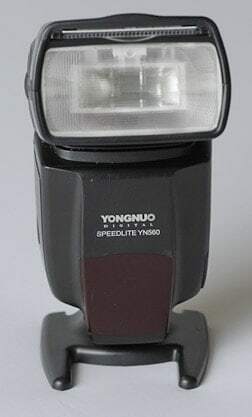 I have also heard the term flash gun used to describe a studio flash (one that plugs into the wall and does not have a hot shoe to mount it to the camera); however, this is more rare. If you are interested in flash photography and want to learn what type of flash gun to buy, visit my recommended flash photography gear page and I'll show you the brands I like and which flash guns give you the best performance for the money. A flash gun is simple to operate. The basic functions on a flash gun are (1) a button to turn it on, (2) a dial that allows you to adjust the power, and (3) a way to trigger the flash at the correct moment. However, some flash guns are more complex–including features such as high speed sync, TTL, and multi-flash modes. High Speed Sync – Most flashes do not allow the photographer to shoot faster than 1/200 or 1/250th of a second. Some even go up to 1/320, but no faster. The reason is because of flash sync speed. Some flash guns have high speed sync, which allows them to overcome this barrier. While this seems like a needed feature, the truth is that very few photographers need it. Even when shooting action, a shutter speed of 1/200 is sufficient because the pop of the flash gun is so short that it acts like a shutter speed in the photo. TTL – TTL stands for “Through the lens.” It is a technology that enables the flash to receive information from the camera about the exposure metering so that it can set the flash power for you. Again, this sounds like a needed feature, but the truth is that setting a flash gun in manual mode is extremely simple. If the photo looks to bright, simply turn down the flash power; too dark means turn it up. Regardless of what type of flash gun you choose, get one! No other piece of equipment improved my photography more than when I purchased my first flash gun. If you need help choosing a good flash gun, check out my lighting gear recommendations page, where I walk you through the gear you need to buy for a basic lighting kit. It's much less expensive than you probably think.